Bradley Thomas "Brad" Lidge (born December 23, 1976) is a former professional baseball relief pitcher. He pitched for the Houston Astros, Philadelphia Phillies and Washington Nationals. Lidge threw a four-seam fastball that consistently reached 91 or 92 miles per hour, as well as a hard, sharp breaking slider that ranged from 85 to 87 mph. He sealed the Phillies' 2008 World Series championship with the final out, a strikeout of Eric Hinske in Game 5. Lidge was born in Sacramento, California on December 23, 1976. At a young age, the Lidge family moved to Englewood, Colorado. Growing up, Lidge was very active, playing football, basketball and baseball among other sports. Lidge attended Cherry Creek High School. Lidge attended the University of Notre Dame, where he played college baseball for the Notre Dame Fighting Irish baseball team. He won the Big East Conference player of the year award during his junior season under coach Paul Mainieri, leading the conference with an 8–2 record and 93 strikeouts in 80 1⁄3 innings. In 2003, Lidge was the winning pitcher in the Astros historic six-pitcher tandem which no-hit the New York Yankees on June 11. That year, Lidge was voted Astros Rookie of the Year by the Houston Chapter of the BBWAA. On September 27, 2008, Lidge became the first closer in Phillies history to be perfect in regular season saves, converting 41 in as many opportunities, as he secured the National League East division title for the Phillies. He is the first closer since Éric Gagné in 2003 to have a perfect conversion rate and 30+ saves. 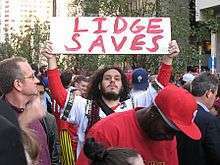 Lidge finished the 2008 season with 41 out of 41 save opportunities, a 1.95 ERA, and 92 strikeouts in 62 games. He saved the decisive Game 5 of the 2008 World Series in Philadelphia on October 29, 2008 with a strikeout, to make him 7 for 7 in postseason saves, thus completing his perfect season (a record he shares with John Wetteland, Troy Percival, Koji Uehara]Zach Britton and Greg Holland; Robb Nen was also 7 for 7 in 2002 before he blew one on the 8th opportunity). 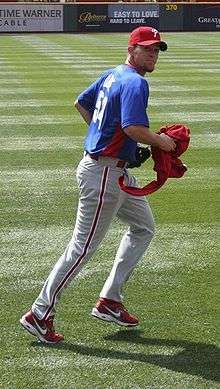 Lidge's 2009 season was a complete reversal of fortune from the prior year, in which he was perfect in save opportunities. Through the month of June, Lidge had an ERA of 7.57 in 27 2⁄3 innings pitched, while he converted only 14 of 20 save opportunities. Lidge missed most of June due to injury, as he was placed on the disabled list due to a sprained right knee. After a troubled 2012 season, Lidge retired from Major League Baseball on December 2, 2012. On August 1, 2013, Lidge signed a one-day ceremonial contract, and officially retired as a Philadelphia Phillie. Lidge currently resides in Englewood, Colorado, with his wife, Lindsay, and their two children, daughter Avery Grace and son Rowan Thomas. He has an interest in archaeology and religious studies and takes online courses at Regis University. ↑ "Cherry Creek Schools Honor Grad Brad Lidge." ↑ "Most Recent No-Hitters, By Team". CNN. Retrieved 2010-04-26.